The Chronicles of Cardigan: Fight, Flight or Turn into Jell-o? Fight, Flight or Turn into Jell-o? Going in the x-pen when the humans are leaving. Going "night-night" in his room crate. "Did you just say 'Dremel'?" So Dewi chose to lie on the floor like a limp squid. It was his only defense. And because Corgis are long-backed dogs, needing proper hind-quarter support when being lifted, it is impossible for me to get him out of this position (without risking spinal injury - to us both) unless I roll him back over and hoist him up -- like a wayward barn animal on a cliff being air-lifted by a helicopter. What does your dog(s) do to get out of doing something "unpleasant"? 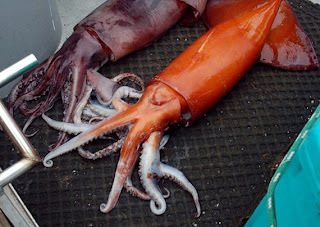 Hope your weekend is pleasant and "squid"-free (unless it's battered and fried, with a squirt of lemon)! Georgia and Bogey hide under the bed or behind the couch. Nick runs through the house with his ears folded back. Rufus does the whole, "If I don't make eye contact, they can't see meeeee...." Looking forward to seeing y'all this weekend! The jelly reaction is exactly what my corgi mix does. He flops down and turns to mush. Luckily, though he has short legs, his back is not nearly as long as a full corgi, so I don't have to be quite so careful about picking him up. My other dog Koira hides. She especially loves hiding behind my chair, and looking away, pretending I am not talking to her. So funny! Jeffie becomes frantic and barks. Tucker quietly slinks away. Rudy, still a puppy, tries to bite the scarey thing. Lucy? Hmmm... not sure Lucy is afraid of anything! That's one reason why she's the queen. Dewi's got the passive resistance thing down cold. Ghandi would approve. That's hilarious! Parker is similar in that he shuts down in the face of unpleasantness. He remains standing, but lowers his head and tail (which takes effort) and stays perfectly still. Skye runs like mad, barking and huffing and trying to turn it into a game. Oddballs. You certainly captured all the phases of "denial" beautifully! Dewi's expression in the first picture (of him, that is, not the squid :-)) is priceless! Poor baby! Jimmy, I can't even Dremel, it freaks him out so much. Wilson is a good boy and stoically just sits calmly and takes it. Well, I don't have a dog but I've been told I dig my head in the sand. Whatever that means. Dewi, turning yourself into a dead weight is the oldest trick and the most efficient! Good for you! Just thinking "blob" can make back breaking work for humans and it serves them right, making us do distasteful stuff..(with cats, it doesn't work as well..but we have the "look." Can't wait to see the photos of y'all next weekend! LOL he goes "dogatonic"! Too funny. :) Dante either comes to a complete standstill and looks at me like I'm the Big Bad Dogbeater (as if), like when he's made to wear a coat during winter walks, or he runs and hides between somebody's legs. Ha! I loved reading the descriptions of all your dogs (and Tom the cat)...and Shanimal :)! I'm always amazed at the differences in personality. Like Couple of Misfits said, they ARE oddballs. @K-koira - So glad your corgi-mix isn't so hard to lift when jellified. @Trude - "Big Bad Dogbeater" So funny! You lost me at squid. Do they HAVE to be so ugly/scary?